Have you ever been to a dinner party before and ate a little too much? Usually, filling my stomach to the brim with good food is easy, but I feel a little sluggish afterward. 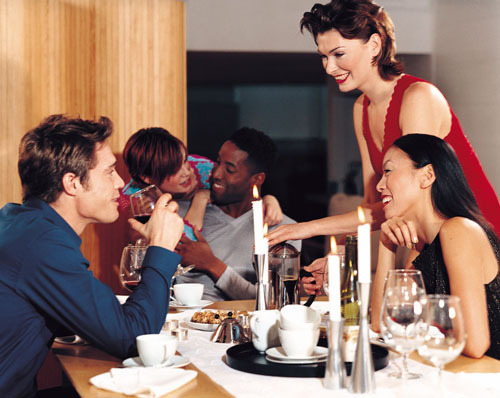 But to keep the good times moving, the host will usually offer a post-dinner coffee or espresso. I usually jump at the opportunity for the “pick-me-up,” but I always end up paying for it the following day. There’s no question that a hit of caffeine will keep you up a little later at night, but the impact it has on your sleep cycle might be more than you think. I was a little surprised when I recently read the findings of a new study that focused on just that topic. More precisely, the study suggested that the equivalent of 200 milligrams (mg) of caffeine (generally what you’d find in a double espresso or larger coffee) three hours before bed can delay your internal clock that tells you when it’s time for bed and when it’s time to get up. And when you delay your circadian rhythm (your natural sleep/wake cycle), bad things can happen. First off, you create a sleep deficit that needs to be made up over time. Secondly, you leave yourself feeling tired, groggy, and unprepared for the demands of the day. Ultimately, this can impact your decision-making abilities and greatly increase your chance for injury. In the study, researchers noticed that subjects given caffeine three hours prior to sleep didn’t have the boost in blood melatonin (the sleep hormone) until 40 minutes after those taking a placebo. This means that caffeine consumption within three hours of your bedtime can delay your circadian rhythm by 40 minutes! At the end of the day, blood melatonin tends to rise in humans, signaling that it’s time for bed. Comparatively, it is lowest in the morning when you wake up. There are various factors that influence its onset, predominantly exposure to light and caffeine intake. Caffeine, the most widely used psychoactive drug in the world, can also block cell receptors that promote sleep. But I wouldn’t go as far as saying caffeine is generally bad. In fact, I would say the opposite—that caffeine, and more specifically coffee, is healthy for you. But this is entirely dose- and time-dependent. Coffee, for example, can lower your risk of cardiovascular disease, liver disease, and type 2 diabetes and can be a great source of antioxidants. But if you want to improve your health, you must drink your coffee in the morning or afternoon—sticking far away from your bedtime. During your next dinner party, if you feel you mustn’t decline a warm drink, ask for some herbal or decaffeinated coffee or tea instead of an espresso. Alternatively, listen to your body and know when it’s time to wind down for the night to ensure you get a good night’s sleep and keep your circadian rhythm on beat! “Caffeine at night delays human circadian clock,” ScienceDaily web site, September 16, 2015; http://www.sciencedaily.com/releases/2015/09/150916161833.htm. Zhang, Y., et al., “Coffee consumption and the incidence if type-2 diabetes in men and women with normal glucose tolerance: The Strong Heart Study,” Nutrition, Metabolism and Cardiovascular Disease, doi:10.1016/j.numecd.2009.10.020. Corrao, G., et al., “Coffee, caffeine and the risk of liver cirrhosis,” Annals of Epidemiology October 2001; 11(7): 458–65. Wu, J., et al., “Coffee consumption and risk of coronary heart diseases: A meta-analysis of 21 prospective cohort studies,” International Journal of Cardiology, December 2009; doi:10.1016/j.ijcard.2008.06.051.